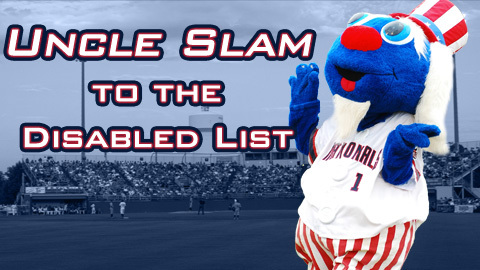 With Potomac under the Carolina League minimum of one mascot, the P-Nats are looking for help from any team or organization that is willing to let Potomac adopt their mascot. Any mascot willing to sign on for a two-month contract with the Potomac Nationals will be handsomely rewarded with baseball bucks, Chilli's Lemonade, Chick-Fil-A sandwiches and the chance to watch fireworks every Saturday night. "Uncle Slam is a huge part of the Pfitz experience," says General Manager Josh Olerud. "While we have to wait for the 2013 season for him to be 100% and back in the fold, we need someone to fill that void we are missing in our lineup." If you or your organization is willing to lend a mascot, please send an e-mail to jolerud@potomacnationals.com. The Potomac Nationals are celebrating their 35th Anniversary of professional baseball and family fun, for all your ticket needs please visit www.potomacnationals.com or call 703-590-2311.